This is Percy. 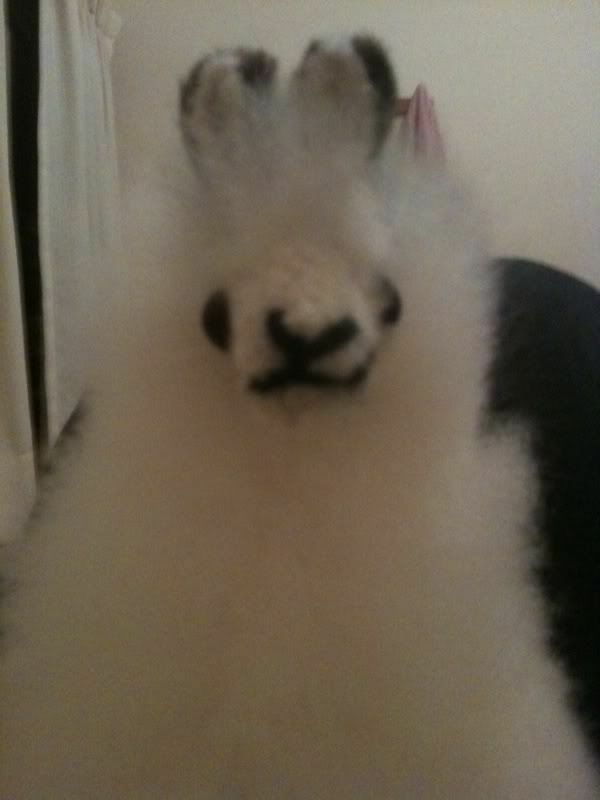 He is a llama (or alpaca? It's unclear...). 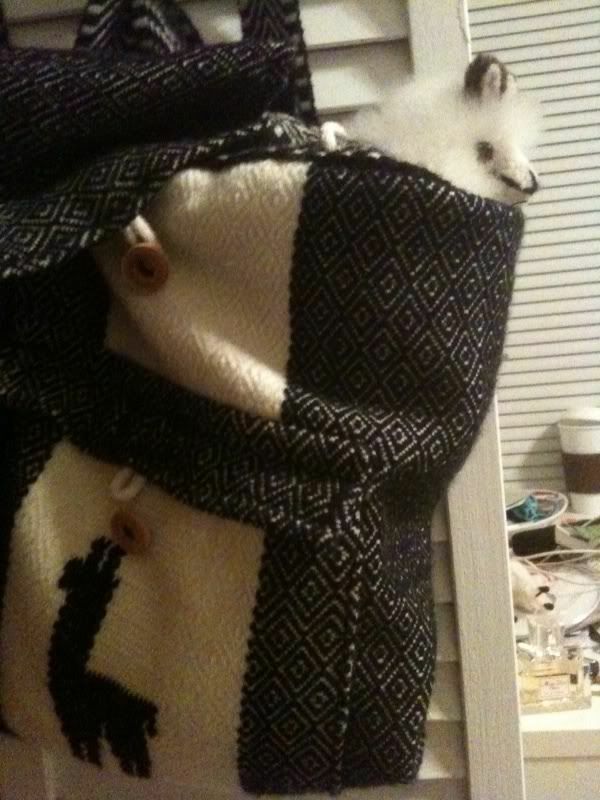 He is made out of real alpaca wool. I named him after our tour guide at Huaca Pucllana, who was by far the best guide of our trip. Our tour guide at al Museo del Convento de San Francisco, for instance, spoke in a monotone at all times and appeared to be actively trying to lose our group as he walked briskly down the cathedral halls. But back to Percy. Isn't he loveable? 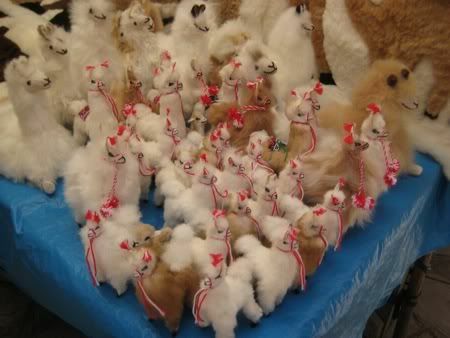 As you can tell from the fabulous art on my blog, llamas are my favorite. 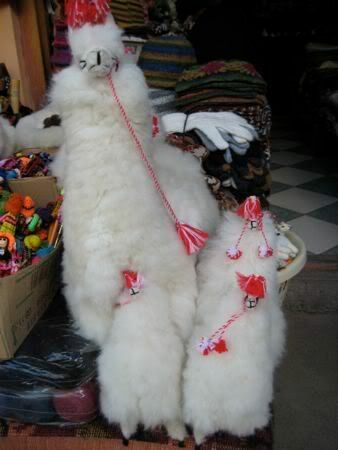 I was so excited to see them in real life and to buy llama-related souvenirs, like the llama-emblazoned backpack you see above. 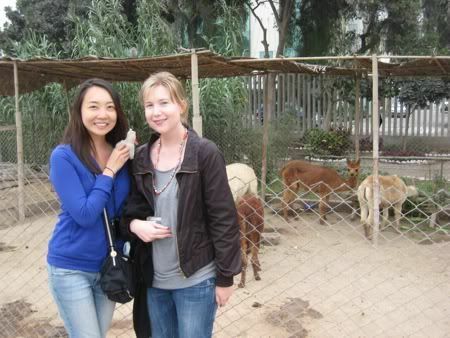 The whole trip, my friend Debie and I cooed at all the llama stuffed animals at every touristy shop. 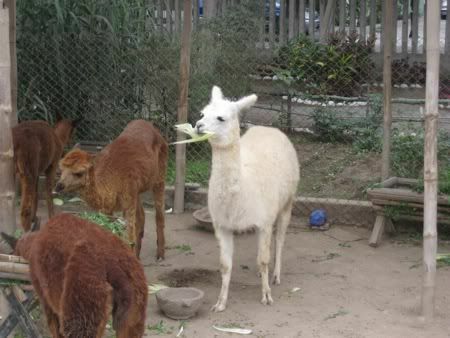 Debie was the first to cave: she picked up a little llama and christened him Gary, after the dearly departed Gary Coleman. We were on Machu Picchu when we first found out Gary died. Now whenever anyone asks me, "Where were you when you heard Gary Coleman died?" 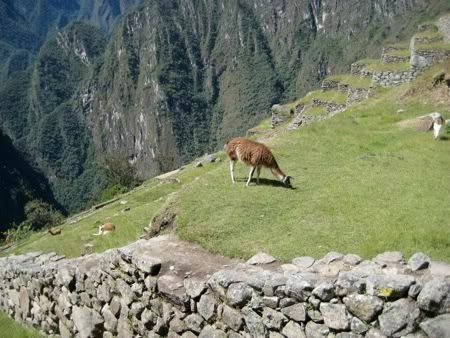 I can say, "Machu Picchu." Top that! 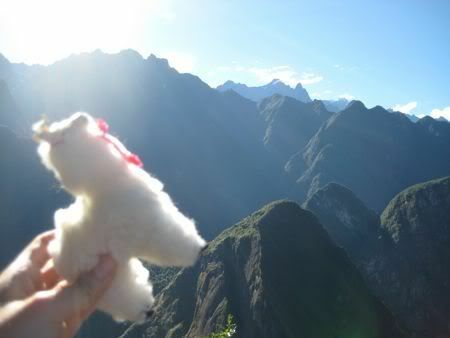 Gary climbing mountains near Huayna Picchu. 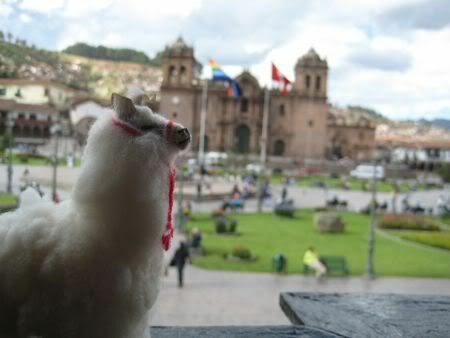 Gary taking it all in at the Plaza de Armas in Cuzco. 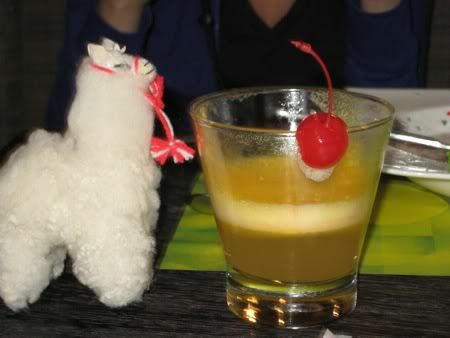 Here's one I took: Gary enjoying a Maracuya Sour. This is where I got Percy, can you spot him in the crowd? A little Peruvian grandma ran this table at Pisac Market. She advertised her wares by picking up a doll, shaking it vigorously, then picking up another. "Llama!" she'd say. Shake shake shake. "Alpaca!" Shake shake shake. "Llama!" Shake shake shake. 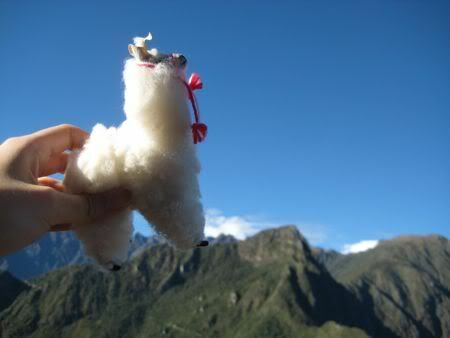 "Vicuna!" Shake shake shake. She was cool. I was laughing so hard that I kept knocking all the little llamas on the floor but she didn't seem to mind too much and I give her props for that. And then there were two - Gary and Percy. Before long though, we acquired an army. 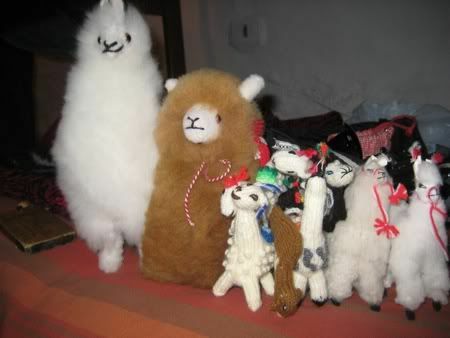 Here's our whole llama/alpaca tribe lined up together. Could it be that we have a problem? Nah, nothing to see here, just two 25-year-old women playing with stuffed animals. They are so cute and fuzzy though. I defy you to hold a stuffed llama without making it trot across the table. It's human nature. We did see real alpacas and llamas though. Here are some at Huaca Pucllana. Here I am with my best friend Gary. I mean Debie. And at Machu Picchu. 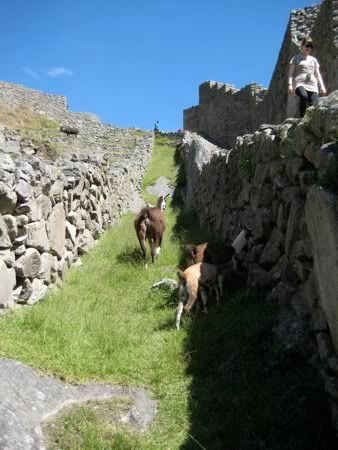 These alpacas wandered free throughout the ruins. Debie, Lisa, Caroline and I pretty much ambushed the poor things and cornered one until we got the chance to pet it. It made a mooing sound and looked worried. ¡Pobrecita! 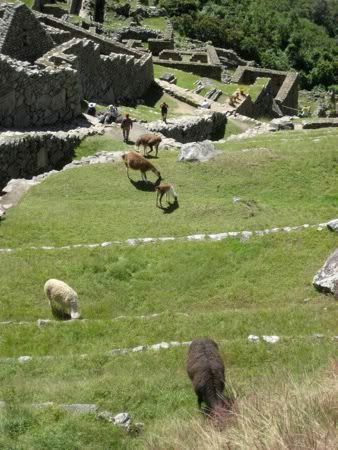 Guards at Macchu Picchu blew a whistle at anyone who stepped on the grass, and I am so thankful that they didn't see us chasing the alpacas. A lot of whistles would've been blown if they saw that spectacle. Here's Percy at the airport, en route to his new home in America. I took him to work on Friday and propped him up on my desk. Everyone loved him. Even a principal at our office petted him. "Does he bite?" he asked. "No, he's docile," I said. And yesterday at work, someone asked me, "Where's Percy today?" I think they noticed his absence more than they would mine. June 17, 2010 by Adele Chapin.